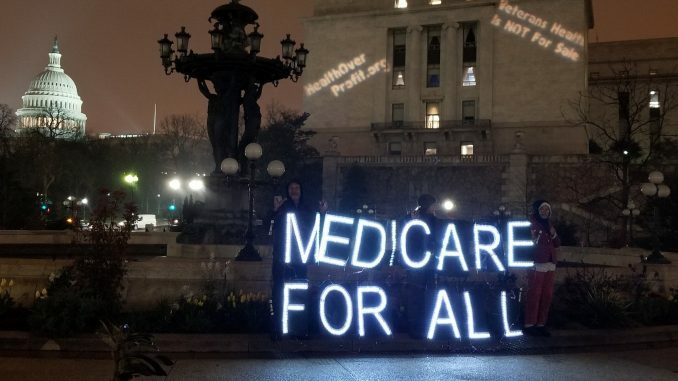 Kevin Drum wrote a piece last week that featured a common, but mistaken, criticism of Medicare for All. The criticism is that Medicare for All will increase taxes and government spending so much that there won’t be much fiscal space left to do other things. This criticism is wrong because the amount of fiscal space we have to pay for non-healthcare items is constrained by the level of national health expenditures not the level of government health expenditures. But this argument is actually “centrist rubbish” to borrow Drum’s phrase. It is based entirely on accounting confusions. 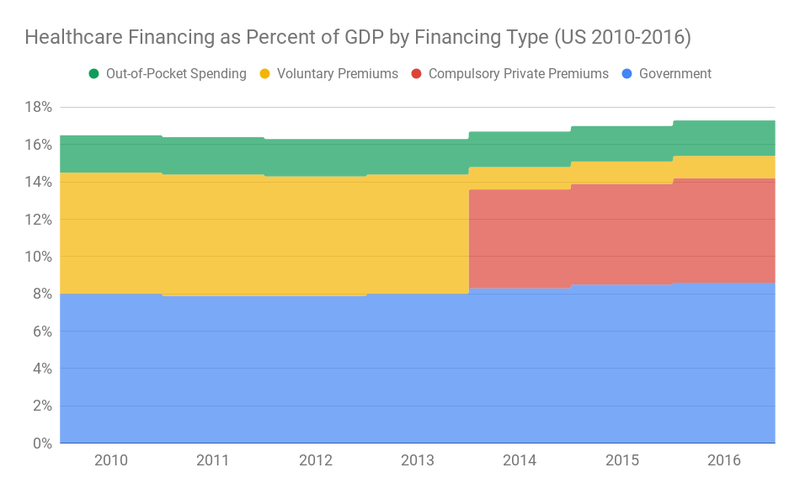 To understand where Drum and Primus go off the rails, it is best to start with the following graph, which uses OECD data to break down the various financing streams for our current healthcare system. The blue part is government spending on things like Medicare, Medicaid, and the VA. The yellow part is voluntary premiums people pay to private insurers. The green part is out-of-pocket expenses people pay directly to health providers such as deductibles, copayments, and coinsurance. The red part is compulsory premiums people pay to private insurers. Before 2014, there were no compulsory premiums. But in 2014, the Obamacare employer mandate and individual mandate took effect, which made virtually all private premium payments compulsory. When Obamacare was being debated in Congress, the CBO nearly declared that these compulsory private premiums would be counted as taxes and government spending (i.e. counted in the blue section, not the red section), but they ultimately decided not to score them that way for basically arbitrary reasons. Under Medicare for All, the blue ends up almost entirely swallowing the red, yellow, and green, meaning government spending goes up by 8 points of GDP (assuming we don’t get big savings on administrative spending and unit costs). Drum and Primus believe that if the blue area goes up by 8 points of GDP, then that’s 8 fewer GDP points available for other kinds of government spending. But this is obviously wrong. To see why it is wrong, all you have to do is think about it for a second. If the government does not take over all of the health spending by implementing Medicare for All, then that means the health sector will continue to depend on the money private individuals pump into it via compulsory premiums, voluntary premiums, and out-of-pocket expenses. In Drum’s piece, he says these private payments are around $1.9 trillion. If the health sector needs those $1.9 trillion to operate, than that money is not available for other uses. If the government is not going to tax those $1.9 trillion to use for Medicare for All, then it cannot tax them for any other purpose. The dollars have to be left in the hands of individuals and businesses so they can pump them into the health sector through the private channels. Another way to see how wrong Drum and Primus are on this is to go in the other direction with it. Right now the government spends around 8.6 percent of GDP on healthcare (the blue section in the graph above). But you could easily convert nearly all of that spending into compulsory private premiums. All you would have to do is convert Medicaid and Medicare into private insurance companies and convert the taxes we currently use to fund those programs into compulsory premium payments now being made to these newly-minted private insurance companies. Nothing really would change if you did this fiscally speaking, but the red area would almost entirely swallow the blue area. Thus this reform would cut government spending on healthcare by, say, 8 points of GDP and, under the reasoning of Drum and Primus, massively increase the amount of fiscal space we have for “lots of other goodies.” This is absurd of course because such a reform would not increase fiscal space at all. Primus and Drum are simply confused. This is the fifth post in our Single Payer Myths series. The series tackles common arguments against a single payer system one at a time.